Whelan has made almost 300 Premier League appearances for Stoke. 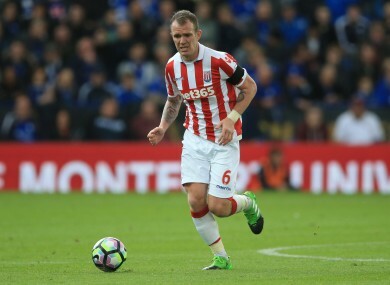 STOKE CITY CEO Tony Scholes has heaped praise on Glenn Whelan, amid talk of the Ireland midfielder’s possible departure from the club. The Dubliner joined Stoke — then a Championship club — from Sheffield Wednesday for £500,000 in January 2008. Since then, 33-year-old Whelan has helped the club earn promotion before making almost 300 appearances for the Potters in the Premier League. “Glenn is one of our players who’s done extremely well again,” he told reporters. He has been, and is, a magnificent servant of the club and everybody connected with the club thinks the world of Glenn and what he has done. “You just need to look at his record. His record over nine-and-a-half years at this club has just been incredible. You could almost argue that Glenn goes down pound-for-pound as one of our best-ever signings, given the appearances he’s made and every summer we bring players in and Glenn maintains his position. Despite Scholes’ praise, however, £1 million-rated Whelan has been linked with a Stoke exit. The club recently brought in Darren Fletcher, who is likely to perform the role in which Whelan specialises. Aston Villa reportedly had a £500,000 bid for the player rejected, while Derby have also been linked with the former Man City youngster. Stoke Sentinel reporter Martin Spinks says Whelan would be a big loss for the club. Glenn Whelan would be a huge loss on and off the field at Stoke after nine-and-a-half years sterling service as a defensive midfielder with a nose for danger, but also as a natural-born leader who isn’t afraid to “call it” when things are not going well. “He has been written off many a time, but has always fought off midfielders brought in to seemingly replace him over the years. But at 33 and with Darren Fletcher the latest challenger for his shirt (albeit he’s 33 as well! ), the end may finally be nigh for Whelan at Stoke. “He would leave with the best wishes of every Stoke fan — even those under-rating his contribution down the years — because along with Ryan Shawcross he is the only survivor of the club’s pre-Premier League days. Email “Glenn Whelan one of Stoke's 'best-ever signings'”. Feedback on “Glenn Whelan one of Stoke's 'best-ever signings'”.